Mykonos has some of the most beautiful luxury villas that could satisfy even the most demanding guests. They can be rented for a week or more and offer their guests a dreamy place to stay for their vacations on the island. 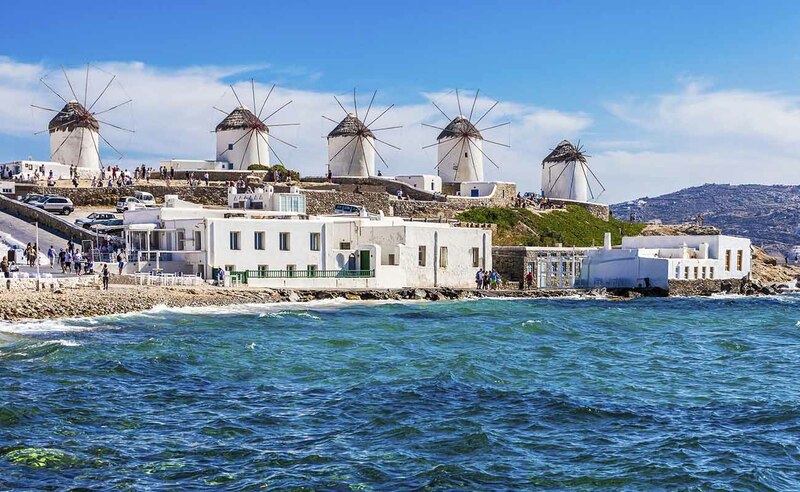 Travelers who seek an extremely luxury accommodation without any limitations on their budget can choose one of the biggest Mykonos Luxury Villas that provide an elegant environment, privacy, high-quality concierge services and all the amenities you could ever need. The following Mykonos Villas can only be described as small palaces suitable for Kings and Queens! Villa Caprice is built on a hill in Fanari area on the northeast part of the island. The venue offers large areas indoors and outdoors and amazing views to the Aegean Sea, Delos islet and the sunset. It has 6 bedrooms and 2 floors. The interior is modern and lavish and the spacious sitting room has huge windows to the sea so that you can enjoy the views even from your sofa or your dining table. The outdoor area is in complete harmony with the environment with a beautiful combination of whitewashed and stone walls. On a private plot of 8000 square meters in a wonderful location at Paraga area, two twin villas create the Paradise Bay Complex. Each one has 8 bedrooms and the total capacity of the complex is 32 guests. The location is ideal for travelers who want to have easy access to the famous party beaches of Paradise and Paraga. The complex has two private infinity pools, a smaller pool for children, large outdoor sitting and dining areas and a private beach. Bedrooms on the upper floor have their own private balconies. Villa Sapphire is located just over Elia Beach, one of the largest sandy beaches of Mykonos. Three floors, 8 bedrooms, 10 bathrooms, a spacious sitting room, and a fully equipped kitchen offer guests the most comfortable accommodation. The minimalistic cozy decoration will help you relax and enjoy your stay at maximum. The infinity swimming pool in front of the building is huge and surrounded by comfortable sun loungers, pergolas, a pool bar, a BBQ and two dining areas. Situated at Tourlos, very close to Mykonos Town, Villa Mediterranean Blue offers a great combination of privacy and easy access to the city. Nine spacious bedrooms, 5 on the ground floor and 3 in the upper, can sleep up to 20 guests. The building has strong influents from the Cycladic architecture and natural materials such as wood and stone are used in plenty. The property includes a tennis court, 3 outdoor sitting areas, a dining table next to the infinity pool and a BBQ. Built on a hill at the peaceful area of Saint Lazarus and offering easy access to the most famous beaches and Mykonos Town, Saint Lazarus Retreat is one of the most romantic villas in Mykonos. It has 6 bedrooms, one of which expands in two levels. Besides the swimming pool, the outdoor dining area, the comfortable sun beds, and sofas, Saint Lazarus Retreat has a beautiful garden full of lavenders, rosemary and olive trees that spread wonderful aromas to the air. Located at Pouli, one of the most beautiful areas of Mykonos, Villa Turquoise offers panoramic views to the sea, the sunset and Delos. Both indoor and outdoor spaces are designed with a mixture of Cycladic architecture and an elegant taste. The villa has 7 bedrooms but for larger groups, it can be rented together with villa Aqua Marine. If the large infinity pool, the outdoor dining and sitting areas, the pergolas and the BBQ are not enough for you, you can easily visit the nearby beaches of Ornos and St John. Just over the beautiful Saint Lazaros Bay, you will find Villa Royal Blue. Three levels include 6 bedrooms, a fully equipped kitchen, and a spacious sitting room. The architecture is Cycladic and the decoration is minimal and chic. The outdoor area offers amazing views to the ocean and consists of a large swimming pool, dining and sitting areas, a Jacuzzi, pergolas and a BBQ.